It is not a trip to Argentina without experiencing Tango. It is the national dance and an amazing experience to watch. We were lucky enough to experience tango several different times during our trip. The first time was in a restaurant in the Centro barrio called Suipacha Almacen. The restaurant is famous for having regular tango shows and live music, but we didn’t know that when we entered. We went in for the promotion menu and the generous exchange rate. Sadly the food was not up to Argentinian standards, but the entertainment was really good. An accordion player started, enchanting my daughter who could not get enough the music. Then the dancers came out and showed us why tango is such a passionate and sensual dance form. Several days later we made a trip to La Boca, the touristy district in the south of the city. Known for its brightly colored buildings and cafes with street performances, we went specifically to see tango dancing on the street. We were not disappointed. The first cafe where we spent the most time had a couple doing formal tango, the tango you are used to seeing depicted in the movies. Here the couple was expertly coordinated, moving as one unit in a slow sensual dance. But we also observed milonga tango (social tango performed by common folks) more typical of the plains region of the country, with lots of fast movements, stomping and teasing. 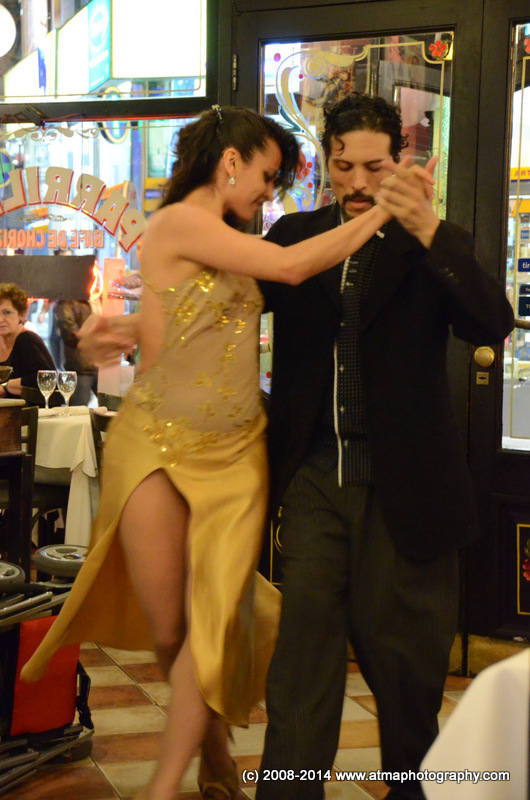 Tango in La Boca. See the intense looks on their faces? The real treat however was that evening. The apartment owner babysat for the kids and my husband and I went to Teatro Porteña to watch a classic tango performance. At the theater we were treated to a spectacular 1.5 hours of Argentinian big band music, singing, and breathtaking tango performances. Here the dance was almost like a ballet. The dancers were nimble on their feet and incredibly in snyc. The performances included many kinds of tango. There were lots of big group numbers with several pairs dancing with big movements, and even swing like flips. There was also the several slow,sensual dances which told a story and fully displayed why this is called the dance of love. One of the best pieces was a quirky dance where a girl actually played both the male and female part, managing to have each hand and leg do something different than the other. Hard to describe but a must see. 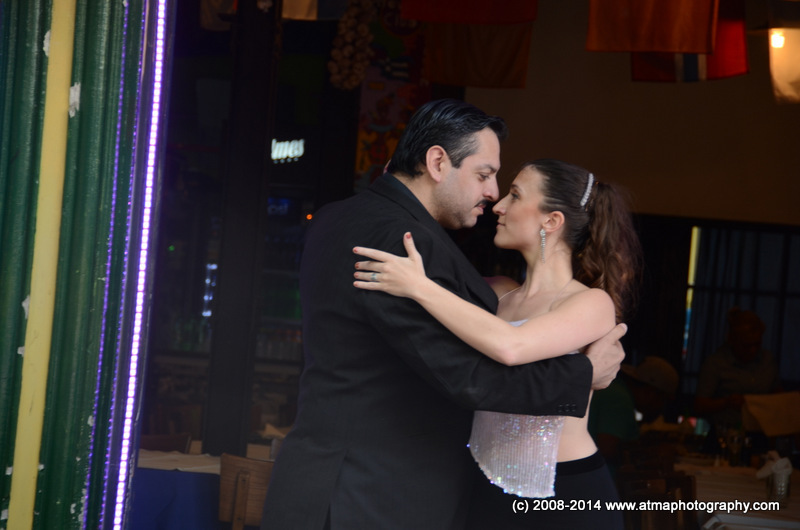 Tango in Argentina is not just a dance, it’s an experience. The music, the motion, it is an immersive experience, filled with all the passion and sensuality you expect of the dance. 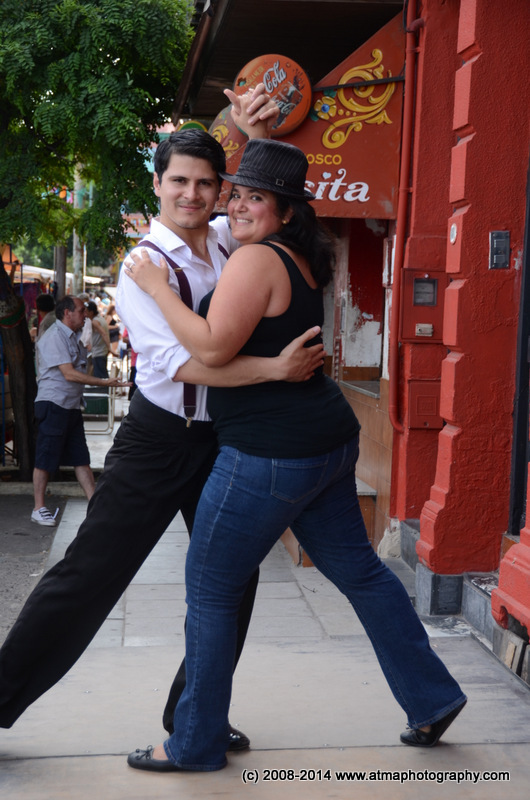 Several people do a tango lesson while in Argentina to be part of that experience. If you are adventurous, I’d highly suggest it to be a part of the action. But even if you are not adventurous to try your hands at a lesson, please be sure to catch a tango show, it will be an unforgettable experience that embodies the spirit of the people and the country. Yes I did a cheesy tourist tango shot. But look at him, can you blame me? Funny I was reminiscing about Argentina this week, too. I was looking through old photos and thinking, there is so much about BA that reminded me of other places like Paris, parts of Spain, California, but the street tango was so unique and so so romantic. I would have posed with him, too. I love your cheesy tango shot! You look like you know what you’re doing as well!